I remember like it was yesterday, when the tiniest, most angelic looking buckskin baby was born on our farm. Her birth was kind of special, she was her mother's first child, and her mother wasn't the smartest cookie in the jar, for all that she was the sweetest most mellow mare on the farm. 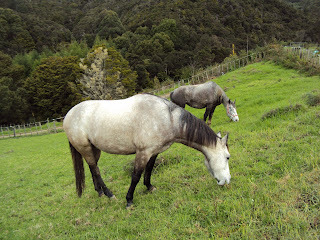 When she was about to give birth, she managed to find the steepest part of the paddock,and just stood there obviously flustered, she never lay down,the foal just slid out, plopping to the ground. While the mare still confused, just walked away to graze. we called to her and the sweet and confused palomino, walked back to sniff at the wet slippery pile of legs steaming on the ground. She looked at it with an expression "oh look a baby! how did this get here?" and suddenly realising her job, and maternal instincts kicking in, began to lick the infant clean. But this mare had given birth on the side of a very steep hill, the foal feeling life and warmth, it wanted to stand and get milk. Usually these first crucial moments of mare and foal bonding, i just watch from the sidelines, nature is usually pretty good at sorting things out on her own. But i watched this wee foal, as it rolled, somersaulted and finally tumbled down the hill, again and again, i couldn't stand by anymore. With some human intervention from my mother and I, the foal was carried back up to a flatter a spot, where it finally mastered its legs and drank. But after its tumbling entrance into the world, this little filly would always be our little Tumble, and the name stuck. Tumble she has always remained to us, affectionately shortened to tumble bumble, tum tums, or tumble bug. the little fine featured buckskin filly, grew into a beautiful sooty dapple grey. She didn't grow that much though, she was meant to be a horse for me, but never grew past pony height. In the scheme of things this worked out well, as at least it meant i wasnt tempted to keep her, as i do have to sell some, to survive. Well to be honest, i was tempted, but couldn't justify keeping her. Tumble has played her own part in the Wild Horse Project to. She was Fern's very first friend, the horse i paddocked with her to help her settle into her new life. Because Tumble has always been the calmest, sweetest and most sensible natured equine on the property. Later it was Tumble, that accompanied the wild stallion on his adventures. Galloping along the beach, climbing sand dunes, and exploring forests. She was his constant companion, mature and sensible beyond her young years, leading the stallion around all the new places. So now almost five years from that night Tumble rolled down the hill . She has sold. I'm sad, it was inevitable, but when i drop her off to her new home on Friday, she will no longer be my Tumble bumble, but the pony of a new and very happy 12yr old girl, there will definitely be a tear in my eye! Sad but sweet, the girl and Tumble will make a wonderful pair. Oh, I loved seeing her on the beach, and how she helped others of your herd realize potential. Sad...but oh so nice that she now will help train another. She really is sweet! what i do on weekend, what do u do? Good horses born or made?? ?